I had the opportunity to review this book published by Packt Publishing and written by Eric Siron / Andy Syrewicze. 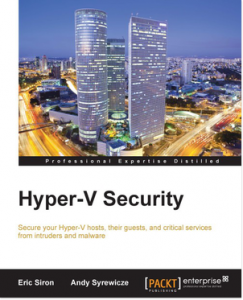 This book provides you with steps to secure your Hyper-V installation. From securing the Hyper-V host, Virtual Machines running on the Hyper-V host to securing the network and storage. All facets of the Hyper-V environment are explained and touched. This book also touches securing your SCVMM environment. If your looking for troubleshooting tips while configuring the security this book will leave you with unanswered questions. It is a good read and explains all the basics you need to do to secure your Hyper-V environment.